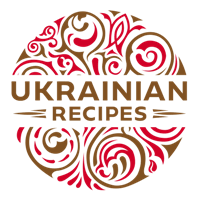 This pre-revolutionary, at least 100-year-old recipe comes from those parts of the Kiev region, where “traditional ovens” - hearths are still preserved. 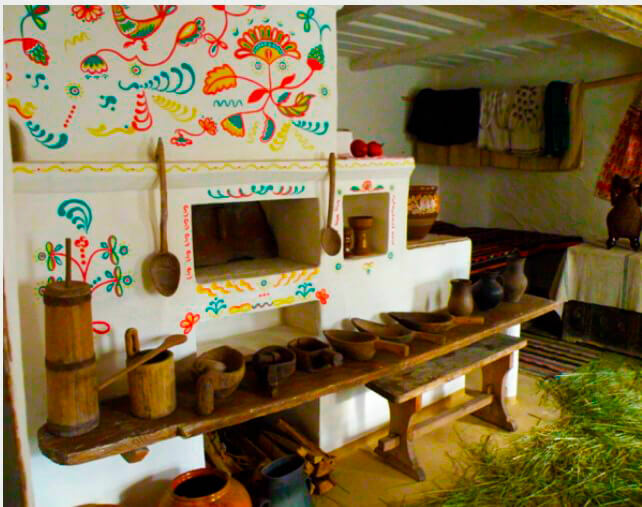 These hearths were specially made to house at least a dozen of Easter cakes, enough to bake treats for all distant and near members of the family. 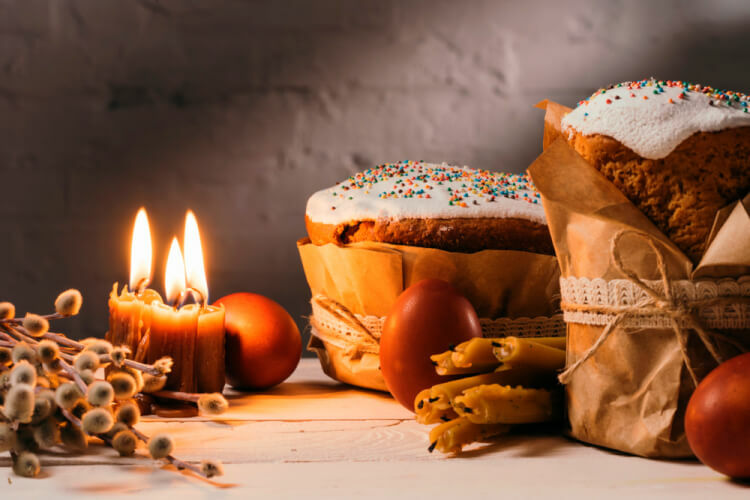 For the whole batch of Easter cakes, prescribed by the recipe, you will need: 3 liters of whole milk (unskimmed milk), 3 dozens of homemade eggs, about 6 kg (13 lb) of flour (depends on the type of flour), 500 g (17,5 oz) of butter (or margarine), 500 ml of homemade sour cream, 300 g (10,5 oz) of live yeast, 1600 grams (3,5 lb) of sugar, 1/2 liter of sunflower oil and raisins (the number of raisins is up to your preferences). The cooking process starts in the evening and first of all the predough is made. Combine half of the prescribed amount of yeast, milk, and flour to get the batter (mobile dough), like for pancakes. Leave it in a warm place to rise, for 4-5 hours. Then stir in the remaining yeast (it should be warm). Add sugar, a little salt, sour cream, and dairy butter melted on a water bath. Separate the yolks of the eggs from the whites and whip the yolks with 200 g (7 oz) of sugar until white. The whites are whipped to foam and are added to the dough at the end (after adding each ingredient, the dough is thoroughly kneaded). Then, in the prepared batter, the flour is gradually poured, until a tender, young, but no longer sticky dough is made. Knead well and leave in a warm place for 4 hours more. In the morning, at about 11 o’clock, the dough should already become fluffy, tender, and alive - breathing and “coming out of the bowl.” Baking molds must be preheated on fire or in the oven beforehand (so that you can touch the inside to grease them with butter), then carefully arrange the dough in the forms (filling no more than 3/4 of the mold). Easter cakes should “spend” another half hour in a warm, quiet place, protected from fuss and drafts. They will rise over the mold edges and then should be put in the hearth. If you bake in the oven, then it’s better to make half or third of the portion because in other case Easter cakes will have to “wait in line” to get into the oven for long and can settle. 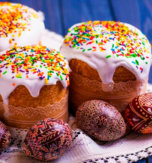 Traditionally, Easter cakes were baked from Wednesday to Thursday, the process took almost 24-hour period, and not a few hours, as it is now, but partially the experience of generations may be useful for modern cookies. 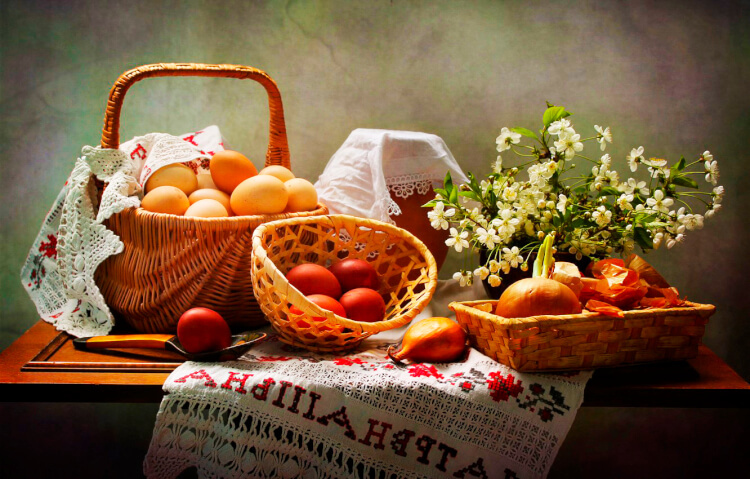 For example, eggs were supposed to be beaten and poured into separate dishes and set aside for an hour so that the yolks turned red and the Easter cakes get a richer color (it is believed that cakes cooked with the yolks alone store for a longer time, without staining). 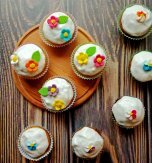 Having prepared all the ingredients, you should light three candles (or at least one) and pray to God to bless you bake lush and yummy Easter cakes. 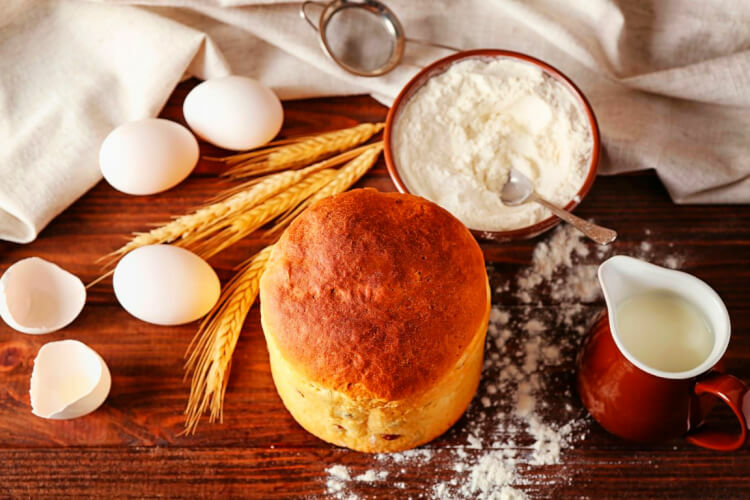 On the day of Easter bread baking, the cookie should dress up in clean clothes and get going with pure thoughts and, preferably, in a cheerful mood, in order to bake good Easter cakes. The whole house should be already cleaned; family members should not quarrel with each other, they shouldn’t hang around the kitchen while the Easter cakes are baked there, too. Even the cookie herself is not recommended to sit around in the kitchen at that time, otherwise "Easter cakes will not rise in the molds." The cooked predough was put in a warm place from the evening and at night a cookie woke up several times, checking whether it was growing well. By the way, the bowl should be covered with rushnyk (embroidered towel). Two consecrated holy willow sticks should be placed crosswise above the towel and two wheat spikelets consecrated on the holy day of Pentecost or Savior of the Honey Feast Day were put at the bottom of the molds in the form of a cross. 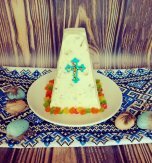 As believed, it is very important to bake good Easter cakes: if the cake cracks from the side - the coming year promises prosperity and all sorts of benefits in the house, if the cake cracks on the top – it means troubles, and if the cake sinks - wait for diseases. 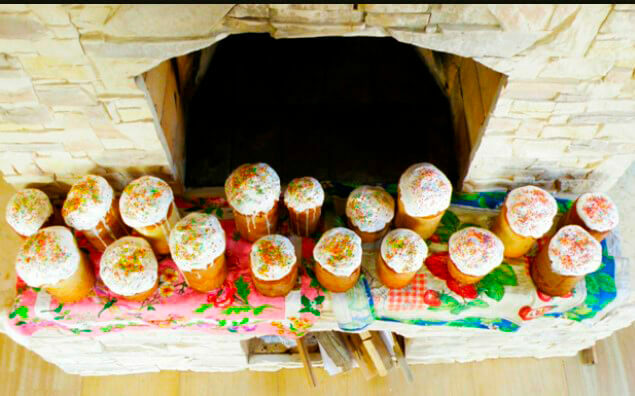 A bad sign is if a stranger enters the house when ready-made Easter cakes are taken piping hot out of the hearth. First, it is better to put the freshly baked hot Easter cake on a grid (until it cools slightly) to prevent the bottom from coming off and only then it is taken out. And if the Easter cake is tall, to prevent it from sinking, you can put it on a towel laid on a tight pillow or mattress. While the cake still has the warm smell of fresh baking, you need to quickly hoist it on a beautiful festive dish and put it closer to the place where the icons are in the house. 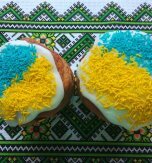 Have you liked the article about Ukrainian Easter bread?